According to the National Highway Traffic Safety Administration (NHTSA), drivers are distracted by something 30% of the total time they spend driving. Some of the distractions included eating, drinking, using a cell phone, beauty routines, and smoking. Engaging in any of these behaviors while driving can be extremely dangerous. The NHTSA along with the Virginia Tech Transportation Institute (VTTI) have also found that 80% of crashes and 65% of almost-crashes were due to someone being distracted while driving. 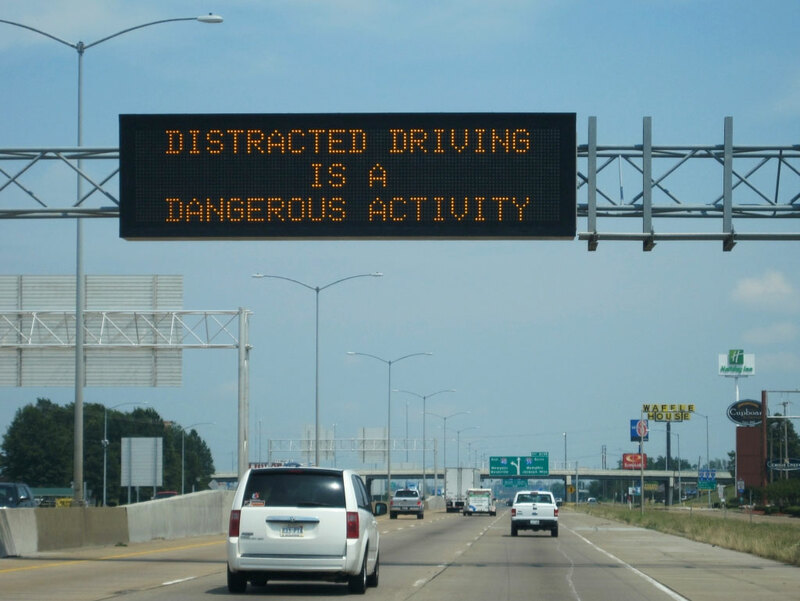 It’s not a simple task to become completely free of distractions while driving, but with the alarming consequences of distracted driving, more and more drivers are starting to take action. The key is to avoid indulging in things that are part of your immediate environment, such as radios and cell phones. Distracted driving is actually a very complicated problem that can’t simply be solved without knowing why the problem exists in the first place. It may help you to try out some of the following ideas to see if these work for cutting out distractions while driving. The NHTSA has put distractions into two categories: inside or outside of the vehicle. Either of these distractions can cause an accident in a matter of seconds, and it will depend on the particular situation you are in when deciding how to effectively deal with them. You may not realize it at the time, but when you catch yourself day dreaming, you’ve experienced being in a trance. Becoming lost in thought is essentially turning off the lights in your brain, which of course distracts you from the road. One of the most common cognitive distractions is worry, which can cause you to think about that one thing that’s bothering you, rather than the road. Try taking some deep breaths. Remind yourself why you need to focus. One very dangerous cognitive distraction is fatigue. There are so many preventable accidents caused by drivers becoming fatigued behind the wheel, and there have even been reports of police officers pulling someone over for suspicions of drunk driving only to find out they are tired. If you find yourself dozing off — especially if it’s from medication — then you should stop driving as soon as possible. Either take a nap, have someone else driver, or park somewhere and sleep for the night. Your fatigue won’t go away until you’ve gotten some rest. Visual distractions include things such as playing with the radio, adjusting a mirror, or digging through the center console. You have to keep your eyes on the road to ensure you don’t venture out of your lane and to keep your reaction time on point. There once was a 15-second rule created by the Society of Automotive Engineers that stated that anything that could be done in the car in the 15 seconds or less is not a visual distraction. The reality is that everyone has a different tolerance for how much time spent distracted may lead to poor driving. Also, the use of cell phones can be classified as both a visual and cognitive distraction due to the nature of the conversation you may be having on the phone. One positive note is that hands-free technology is allowing people to avoid the visual distractions associated with cell phones. Any kind of sound coming from the car can also be a big distraction for drivers. If you pay attention to a loud noise in your car that may warn of a problem, you’re not exactly distracted; you’re focused on the performance of your car, which is a part of safe driving. Avoid using the DVD system. If you’re not going to turn these off, at least turn down the volume. Biomechanical distractions are those that take place when you are performing actions with the car. Some of these distractions include turning knobs, pressing buttons, and pulling levers. The good news is that you don’t have to eliminate these actions to rid yourself of the distractions. You can simply make it a habit to adjust everything you need to before you start your drive. Adjust mirrors, seats, and the steering wheel before you leave so you don’t have to mess with them while driving. Use the automation provided by your vehicle. For example, you could learn the ins and outs of your navigation system or how to program your radio for multiple drivers. There are even some upscale vehicles that offer programmable buttons for each seat so that someone may push a button to have their driver’s seat set to a specified position. While driving on the road, you’re always checking the scene to further engrave your defensive driving habit. Unfortunately, that means you have to battle the visual distractions you may see when looking out your window. Of course, it’s near impossible to just 100% focus on the asphalt, but quick glances are something you can do to limit visual distractions. Sounds from the outside can also become a distraction — in particular, loud horns. Trust all of your senses to compensate for the other when one becomes distracted by something outside. It’s a natural reaction to look where you hear a loud noise, but a quick glance is all you need to assess the situation. However, if it’s a sound you haven’t heard before and you suspect something may be wrong with your car, you should pull over and check it out. The amount of distractions you experience while driving, whether inside or outside the vehicle, will depend on how prone you are to becoming distracted in the first place. Two factors involved in this include your personality and your current state of mind. Of course, it’s much easier for you to control what goes on inside your car. As an example, you can always establish pre-drive habits such as adjusting everything you need to do before you start driving so you can avoid being distracted by them after you leave. You can also choose to ban yourself from eating or drinking and using the cell phone while in the car. You can significantly reduce your odds of getting into an accident by lessening your distractions, and you can more effectively control those that happen inside your vehicle. If you’d like to read more about what groups of people are most prone to accidents involving distractions, you can read some of these research reports. You can also check out a recent distracted driving report from AAA.